Ballard, Robert D. Finding the Titanic. Q. 1993. 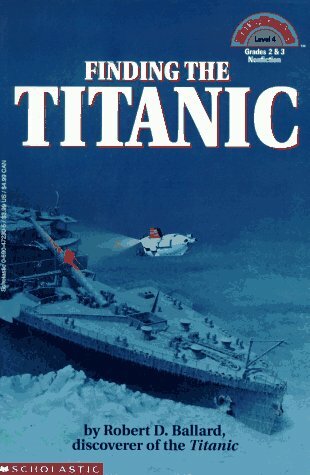 A more complex book about the Titanic than others. The book alternates between a historical narrative following one twelve-year-old girl exploring and then escaping the ship and a discovery narrative closely following the archaeological team. Kids who are interested probably have outside knowledge from more recent books. Illustrated with detailed paintings as well as period photographs and photographs of the archaeological process. Chapters are 6-10 pages long. The Titanic: Lost… and Found. N.
Donnelly, Judy. The Titanic: Lost… and Found. N. 1987. 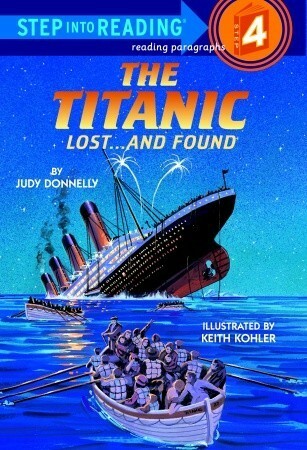 This is a nonfiction book about the size and details of the Titanic, the shipwreck, and, finally, the discovery of the wreck 75 years later. The story of the wreck is a narrative but does not follow any one person in particular. Kids who are interested probably have outside knowledge from more recent books. With illustrations in marker. Chapters are 10-15 pages long. Hammonds, Heather. Transportation through Time. P. 2003. The histories of ships, carriages, cars, trains, balloons, dirigibles, airplanes, spaceships and more are detailed with pictures and question prompts. Yellow bolded words go to a glossary in the back. “Imagine…” question prompts can be poorly worded and confusing to kids (like implying there were no cars before 2003!). DESC: This book introduces readers to the lives and work of the two brothers who invented the first engine-driven flying machine. Heroes of the Revolution. P.
DESC: From spying on the British to rescuing fallen soldiers on the battlefield, these twelve men and women stand as unforgettable heroes of Revolutionary War. David A. Adler’s lively anecdotes and Don Smith’s bold paintings present a dozen figures whose courage and determination to seek freedom were indomitable in their own time, and remain a shining example in our own. DESC: It isn’t much fun being ill, but Karlie lives in a famous old house full of secrets, so at least now she has time to solve a mystery. When Karlie discovers hidden treasures, she learns about another young girl – just the same age as she is now – who lived in the house more than one hundred years ago.